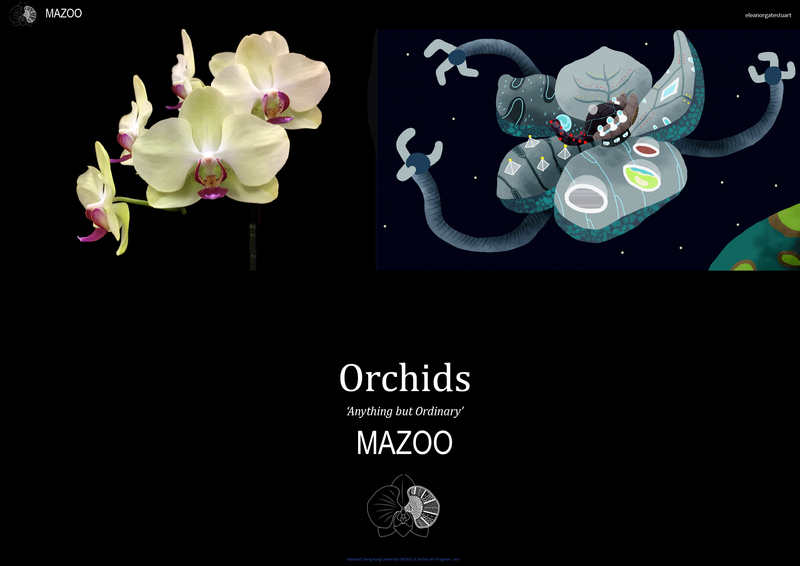 Mazoo a mythological science-art spaceship laboratory travelling the galaxy (in this case the internet) on its journey, sharing knowledge of the wonderful Orchid plant species. Dr Eleanor Gates-Stuart (Professor Techno Arts) and the Orchid Team: Kai-Hsing Hung (Jimmy), Hsiang-Hsi Lu, Hsing-Cheng Chen (Rider), Jiun-Kai Huang, Yin-Shou Chen (Jessica), Wei-yu Lu, Xin-Hung Lin (Ace) collaborated with ORDC and Professor Hong-Hwa (Director ORDC) in communicating the research of Orchids. Click on the pages below to read more about the project. Please note: Images must not be reproduced as the copyright belongs to the individual artists.